Colonoscopic surveillance for risk of colorectal cancer (CRC) associated with inflammatory bowel disease (IBD) is recommended annually beginning at 8 years disease duration in ulcerative pancolitis and Crohn’s colitis. Family history of sporadic CRC raises the risk of CRC by twofold, and association with primary sclerosing cholangitis by fourfold. 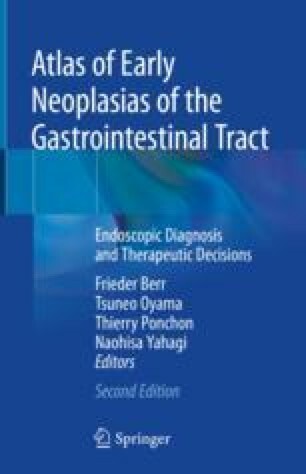 Optimized conditions for endoscopy, random and targeted biopsy requirements, and patient information and compliance are essential for success of the surveillance program, as well as experienced endoscopic detection and classification of neoplastic lesions as (1) sporadic lesions (in uninvolved colon) and in involved bowel, (2) polypoid dysplastic lesions, and (3) non-polypoid dysplastic lesions. Endoscopic en bloc resection (with free margins) is recommended for all resectable lesions without invisible dysplasia, whereas sphincter-preserving colectomy is recommended for endoscopically unresectable non-polypoid lesions and invisible lesions detected by random biopsy. The contribution of a case by Dr. Gerhard Kleber of Aalen, Germany, and the evaluation of histology by Dr. Daniel Neureiter of Salzburg, Austria, are gratefully acknowledged.